VANCOUVER, BC – The Museum of Vancouver (MOV) is pleased to present an intriguing exhibition about the significance of collecting. All Together Now: Vancouver Collectors and Their Worlds – on view at MOV from June 23, 2016 to January 8, 2017 – features wall to- wall displays of rare, unconventional, and awe-inspiring objects from 20 diverse Vancouver collectors. Taking inspiration from the eclectic cabinets of curiosities belonging to 17th century scientists, All Together Now features floor-to-ceiling displays, portraits of each collector, and numerous tactile experiences for visitors. These interactive components include playing pinball machines, trying on corsets, listening to long-forgotten bands, and handling historical artifacts. This captivating sensory experience not only showcases intriguing items, but the stories of their remarkable collectors: Angus Bungay started collecting action figures when he worked in the animation industry; Imogene Lim, an anthropologist, gathers Chinese- Canadian menus because they connect to her family story and her interest in intercultural history; Kyle Seller’s numerous pinball machines are featured in pubs across the city; prosthetist David Moe’s assortment of vintage artificial limbs stems from his father’s profession and offers insight into the rapid development of medical technology; and Melanie Talkington observes the changes in fashion and bodies through the ages with her largest-in-the-world collection of 19th century corsets. Vancouver-centric collections also feature prominently in All Together Now: Lyanne Smith and Angus McIntyre’s ephemera from public transit documents its history in Greater Vancouver; social worker Willow Yamauchi’s collection of her father’s drag queen costumes also includes materials from his beloved 80s Vancouver band, the Bovines; and Major James Matthews’ hunting compilation forms the core of the MOV and Archives collections, shaping how we understand Vancouver today. As a way to further engage with the exhibition, the Museum invites people to post pictures of themselves with their collections on social media, using the hashtag #mycollectionatMOV. These images will animate the exhibition space through large projections. MOV will also ask visitors to consider collecting in their own lives through upcycling workshops, collector show and tells, and a symposium on the role of community engagement in museum collecting. The Museum of Vancouver connects Vancouverites to each other and connects Vancouver to the world. The museum’s programs, exhibitions, and collections bring people together and inspire conversation about the future. The museum, an enthusiastic civic advocate, is an independent non-profit organization dedicated to inspiring a socially connected, civically engaged city. 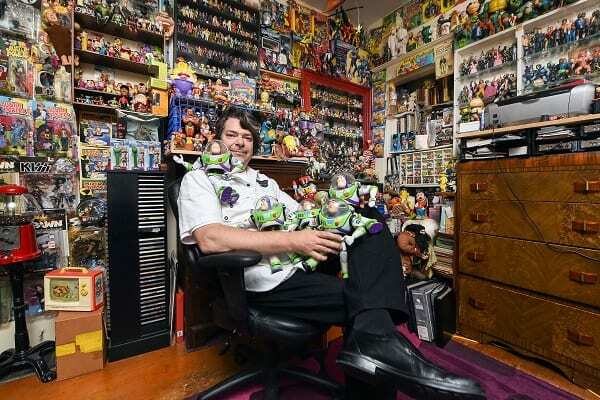 Angus Bungay: Action figures and toys will be at the show.